This past weekend, I felt like I was having lunch with a character straight out of myth. My dad’s VFW post held its annual summer picnic. It was a nice afternoon of food, fun, and chatting for the veterans and their families. At my table were a handful of Vietnam veterans, my dad included, whom I see every week. Then there was Jim: a World War II veteran. Jim is in his 90s, and he can’t be more than 5’2” and 100lbs. Yet, he is deceptively fit and spry. He gets around on his own, he is mentally sharp, he can see and hear better than all of the Vietnam vets, and he ate more than I did. I lost count of how many plates of food and ears of corn he went through. Jim was there by himself, and he didn’t say much during the meal. After eating, he took off his “World War II Veteran” hat, placed it on the table as if saving his spot, and wandered off. While he was gone, my dad asked if Jim had ever told me his story. Generally, it seems all veterans have lots of stories about their days in service. But, it seems like many also have their one big go-to story – that one story that, if they only have a chance to tell you one war story, this is the one. Over my years of going to the post with my dad for events and volunteer work, I’ve heard a good number of these stories, mostly from the Vietnam vets. But, I’d never heard Jim’s story. My dad explained that Jim and his platoon were marching along a hedgerow in France that cut off line of sight to the other side. 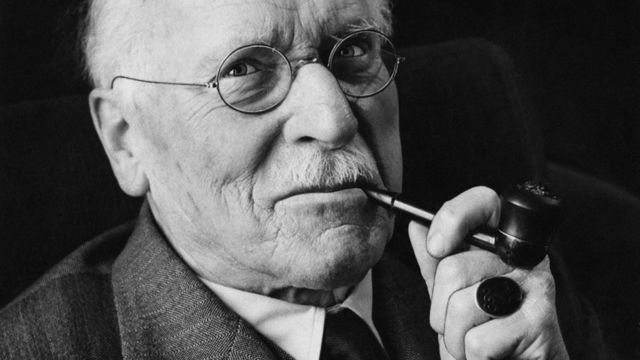 At some point, the hedgerow either ended or there was sudden visibility through the hedges, and to their surprise, a platoon of German soldiers (who were equally surprised) were marching along the other side. A firefight ensued. Jim was shot, but he “won” and obviously survived. The hedgerow was perfectly manicured and the day was just slightly gloomy. My perspective hung twenty feet over the ground, looking down on two rows of soldiers. The Americans were all dressed in clean, shiny, perfectly pressed green army outfits. All of the men were ruggedly handsome with square jaws and five o’ clock shadows. Jim was now 6’2” and 190lbs, his biceps exposed and flexed to hold on to an oversized gun. The Germans were also well put together, but wearing gray uniforms with bold, red swastikas stitched on. All of them were unattractive. When the shooting started, it was bloodless even when people were hit. Jim was struck, but while falling backward in slow motion, he fired back. He found his mark, and then collapsed into the grass and the camera receded into the sky, looking down as soldiers ran to his aid. When Jim sat back down at our table, I glanced over at him and had this weird sensation like he wasn’t even real. 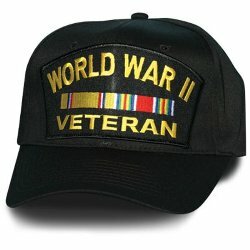 “A World War II veteran? It can’t be!” It was like if I had seen the kids at the picnic getting pony rides on a unicorn. I was caught off guard by this feeling, because I was already aware that there are a few World War II vets at the post, including Jim who I’ve run into several times. And, obviously, I know World War II happened and that real people were involved. I can’t blame the students, though. This year’s class of incoming Freshmen was born 20 years after the end of the war, and many current students have parents who weren’t even born when the Vietnam War started. I was born just over 7 years after the fall of Saigon, but my dad was in Vietnam nearly a decade before that. Vietnam always felt real to me, for obvious reasons. I grew up with a Vietnam vet telling me war stories all the time. I saw his pictures – the ones the army let him keep – and nothing about it looked glamorous. Rare were the pictures of soldiers wearing clean, shiny, perfectly pressed outfits. No one was a Sylvester Stalone sculpted Rambo; everyone looked skinny, tired. They all looked like kids. They were kids. World War II, on the other hand, I’ve had limited “real” exposure to. To my knowledge, none of my immediate family fought in the war. My grandfathers were both too young to fight in WWI and then too old for WWII. My dad was only three-years-old when WWII ended and my mom was not yet born. 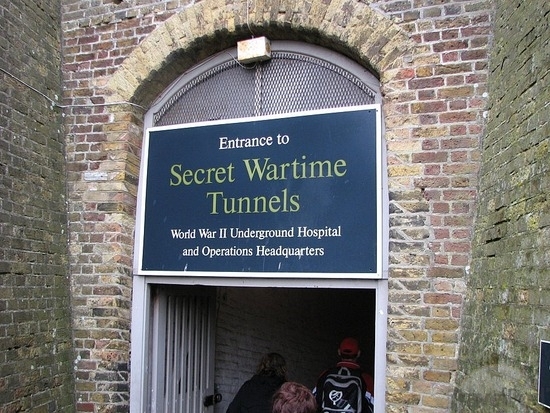 I’ve seen museum exhibits, and I’ve been inside the Secret Wartime Tunnels in Dover, England that served as a military headquarters for Winston Churchill and the British. I’ve had history classes, I’ve read textbooks, I’ve watched documentaries, I’ve worked with history buffs like Michael Stelzer Jocks. Yet, still, World War II seems so distant and feels as “real” to me as even more distant conflicts like the Civil War or the Revolutionary War. World War II is such an amazing story: Good Guys v. Bad Guys, American Heroes vs. history’s ultimate supervillain Adolf Hitler. Oh, wait. There’s more to the war than that? I know there is when I stop and reflect logically. The horror of the war is overwhelming: the tens of millions of fatalities, the genocide, the atomic bomb. It is hard for me to even process the scale of the war. Thinking of it as real is beyond sickening. Maybe that’s why some American versions of the events are slightly-glamorous tales of Good triumphing over Evil. My most frequent exposure to the war has come through art. 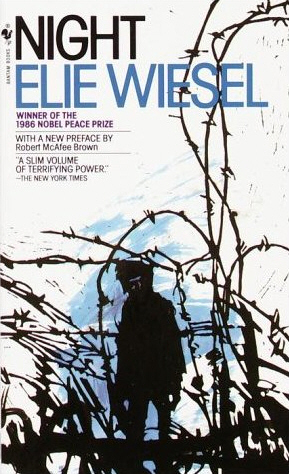 I’ve read Night by Elie Wiesel and Maus by Art Spiegelman. I’ve seen my share of WWII movies. Some art does try to reflect back on the reality of the war, but still, it is art rather than experience. 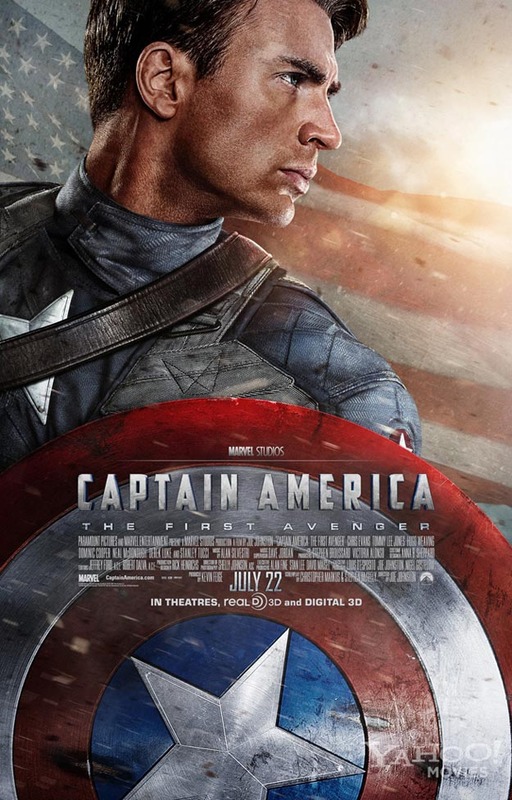 WWII also crops up in not-so-real fictional films like Inglorious Basterds and Captain America. It’s hard to see WWII as a real event in a film involving a shield-toting superhero fighting a skinless, red supervillain. I’ve seen WWII through a fictionalized lens so many times that when I heard a real WWII story, my mind immediately saw it through that lens. So, there is Jim, sitting at the table. He is more than 60 years older than me and participated in a war of mythic proportions 40 years before my birth. Of the more than 16 million Americans who served in the war, he is one of approximately 1.7 million alive today. I am old enough to remember the Gulf War. I was in college when 9/11 happened. I watched those conflicts unfold. Like us all, I see people daily who have served in contemporary conflicts. They are real; those conflicts are real. But World War II, it’s harder to imagine it happened when our living links to that event are rapidly dwindling. And it was strange and interesting to see one of the characters in that story sitting at my table, eating lunch with the rest of us. By Blake Whitmore, RMU Student. 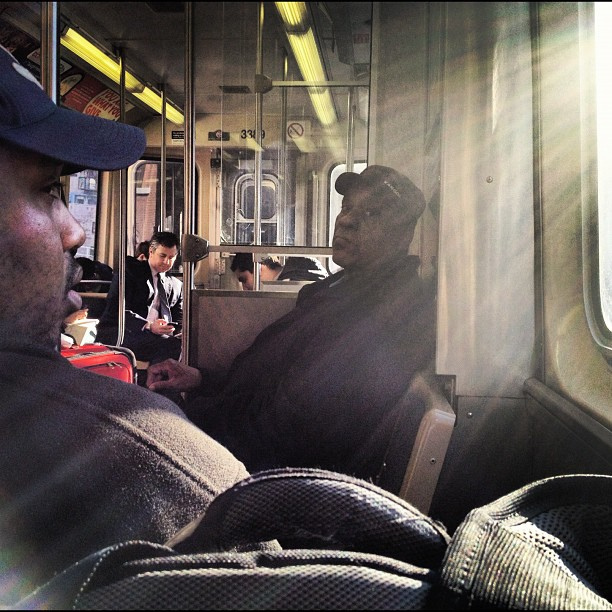 I enjoy looking around at all the different people on the CTA red line train during my morning commute. I look around making up elaborate back stories for the all the individuals. The woman sitting across from me had a small stain on her dress. I imagined it was from a cup of coffee a few months earlier. She went on a date with the most amazing guy that made her laugh a little too hard, causing her to spill a little of her frothy whipped mocha coffee on her dress. The small mark never fully disappeared, but the dress fit her too well and had too many memories to throw it away now. The engagement ring on her finger seemed new, since she continued to play with it and spin it around her finger. She seemed happy and that made me happy. A man sat next to me. He hadn’t shaved in a couple of days. Dark plump bags rested underneath his eyes. He pulled out a small pair of glasses and put them on and reached for a notepad from his bag. He began writing, but I couldn’t tell what because it was in Russian. I recognized it because my roommate and her family are fluent in Russian. I imagined that he moved here years ago to benefit his three daughters. He wanted them to have a better life than he had, so even though his degrees in Biomedical Technology weren’t recognized in America he and his family packed their bags. He picked up an entry level position at a telemarketing firm to support his family. He worked long hours and got paid barely more than minimum wage. His only escape was the small short stories he wrote in his notepad. He seemed sad and that made me sad. I did not know these people and they didn’t know me. We pass countless numbers of people every day through our morning commutes and our trips to the grocery store. Only for a brief moment are we a part of that person’s life, and them a part of ours. I look up and down the train car one last time. Most people are buried in their phones and tablets, but I catch the eye of a woman at the end of the car. Her clothes were tattered and covered in filth. Her toes showed through the holes in here sneakers. Her blank stare read like she had no home, no place to wander to after a long day. She doesn’t look happy or sad as a man knocks into her pull cart and doesn’t even acknowledge her existence. I smiled at her. She smiled back and I got off the train to walk to work. I know nothing about her, but I will never forget her. Walking up the stairs to work I wonder if she will remember me. Will the newly engaged girl with the cute stained dress remember me? Will the Russian writer even know I was there? I looked down at what I was wearing: a summer dress and flip flops. What did that give away? Do they guess at my back story? Every weekday morning my alarm clock goes off at exactly 7:00 AM. I get up and begin the daily routine. That word routine makes me cringe. The mundane routine of a 9 to 5 job has finally set in, but I still look forward to my commute. I leave my apartment at exactly 8:15 AM with a travel mug of hot tea and a good book in hand. I run up the stairs of the CTA platform only to barely miss the train heading south. I place my headphones in my ears and press play on whatever Spotify playlist I have a hankering for that morning. I crack open my book and read a few chapters before the train gets really crowded, but no one notices. I am just another passer-by. By Tricia Lunt, English Faculty. Well, not quite. Stacy is not yet 40. I am headed to celebrate with her, the “youngest” amongst us, in Columbus over Labor Day weekend. Like the youngest in every group, she never lets us forget. I should know; I am the youngest of my siblings, so even though I am not young, per se, I am the youngest, which is still something. Although I am no longer young, I still feel rather youthful, and I certainly don’t miss youth. So much worry: anxiety and naiveté all wrapped in uncertainty. I do miss the notion of infinite possibility—where would life take me, I wondered? With age, possibilities narrow. Some possibilities are still within reach, some aren’t. “And so it goes,” said Vonnegut. As far as getting older is concerned, I tend to hold to the maxim of “it sure beats the alternative.” One of the many wonderful things about aging is the legacy of love shared with others. Many people have been my friends for more than half of my life. My “high school” friends, all of whom I have known since I was 16 (or even earlier), and I have shared tremendous things—a group of us actually went along on Jenny & Brent’s honeymoon trip from Munich up the Rhine via riverboat to Amsterdam! We’ve celebrated accomplishments large and small. More importantly, we were there. Memories do not conform to the laws of physics: moments feel like a bazillion years ago and yesterday in the same instant. I recently discovered a photo that I thought no longer existed. 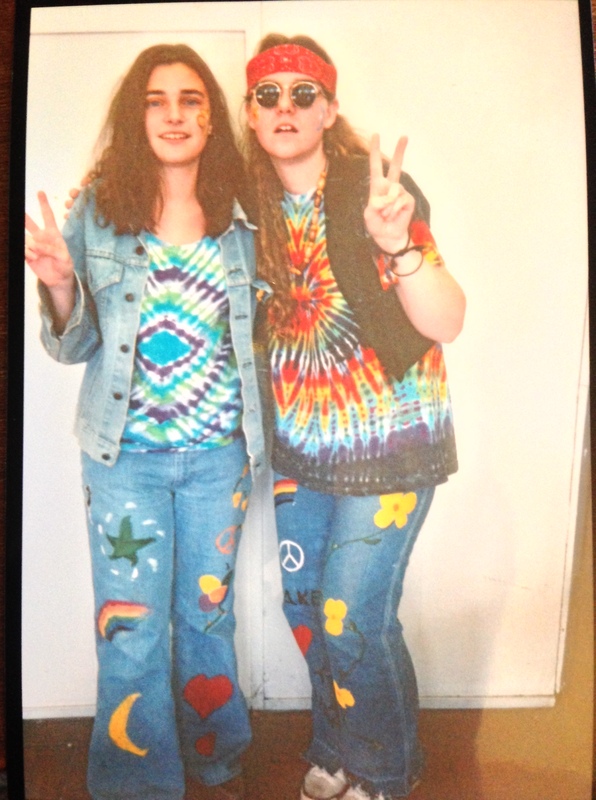 It is a picture of Stacy and me; we are 17 in the photo. 23 years have passed, quite impossibly, quite miraculously. Even if the picture had not reemerged, I would have remembered the moment. The photo is evidence of a particular moment. Countless others went unrecorded, but remain the foundation of over 20 years of friendship. Consider those statistical breakdowns performed to measure how people occupy their time. You know the ones that reveal terrifying truths like the average American spends 34 hours per week watching TV (seriously! My guess was 18) I shall now endeavor to quite unscientifically quantify the time spent with my high school friends, all of whom I still see as often as possible and torment with even more frequency. Knowing what I know, speculating and hoping and looking back with my most sentimental vision, I’d suggest this might be a fairly accurate representation. Here’s to looking forward to another 23 years, and another. Have you seen this video yet? A 24 acre-wide sinkhole in Louisiana is growing, and taking down everything in it’s path. Watch as a clump of trees disappear into the murky water. When I first saw this, I was mesmerized. Immediately after the two minute video was over, I hit replay. On my second viewing, I realized that this video gives me the heebie-jeebies. There is something inherently disturbing about this clip. For me, and I am sure for millions of others, watching this event produces a eerie, nightmarish dread. This fear is primordial. Here’s a radical idea we can all agree on: The earth should be stable. It should not move, shake or fall away for no reason. Humans want and need terrestrial stability, and so, when that stable illusion is shaken, or destroyed, it produces a gut anxiety. I personally, though minimally, can speak to this truth. About 5 years ago, I suffered a slight case of vertigo. It constantly felt like the room was spinning. My footfalls were trepidatious. I felt powerless and anxious. The vertigo would only be intensified by this anxiety. As soon as I felt it coming on, my feelings of nervousness would automatically spike, causing in turn a more pronounced and intense vertigo sensation. It was a truly vicious circle. This video produces a similar vertiginous anxiety, mixed with a hint of the frightening supernatural. Does it not seem that the earth is alive, and it hungers for the surrounding environs? The ground maw slowly expands, ‘eating’ trees. As I watch the trees go under, I have a hard time not imagining the underworld that lies beneath. What is down there? Where does it stop? Does it keep going down into a hellish netherworld of unspeakable darkness? And, so, a third primordial fear is added: hell. It should not be surprising that so many religious cultures of the world place ‘hell’ under the earth. This expanding swamp in Louisiana seems like the River Styx on earth. Of course, I know I have nothing to fear from this sinkhole. So, why the dread? Perhaps these are universal nightmares; a collective consciousness of fear. Perhaps they fit into a Jungian archetype of terror. Or, perhaps Charles Darwin can provide us an answer as to why a video taken of a place 1000 miles away can inherently produce unreasonable fright. The naturalist, and Darwinian scholar E.O. Wilson believes such universal, arcane, irrational fears often come from our genes, and have an evolutionary basis. Just look at our fear of snakes, which we share with our primate ancestors. This fear makes complete evolutionary sense for monkeys and apes living among poisonous, tree-dwelling serpents. But, why would modern urbanites still be so afraid of these slithery creatures? 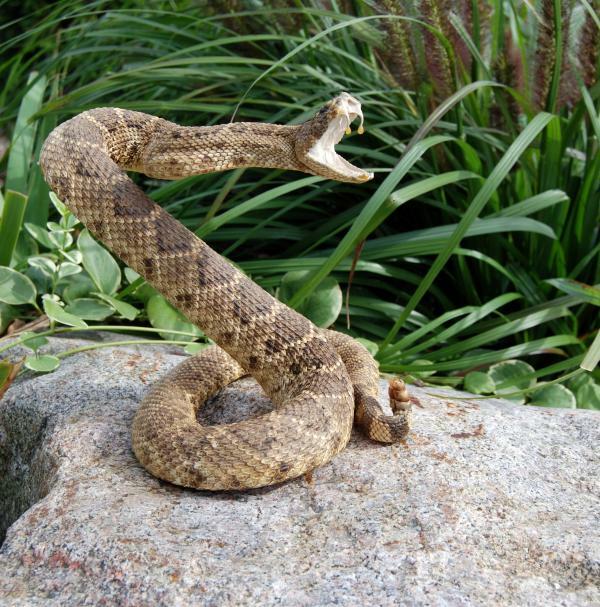 Simply show a photo of a snake to many people, and they instinctively produce a guttural, gasping sound. People jump back, turn away, and cover their eyes. In other words, they physically react in fear. Most humans today have never seen a snake that is not behind glass, and yet, the fear seems inherent and unshakable for so many. Is this based upon our history and culture where snakes always catch a raw deal? From Medusa and her hair made of snakes, to the serpent in Eden; from Voldemort’s Slythrin House, to Samuel L. Jackson fighting “Snakes on a Plane,” these animals can always be counted on to freak people out. Is this a Jungian archetype or Darwinian vestigiality? Perhaps a bit of both. Perhaps my fear of the sinkhole falls into the same categories. I am as likely to fall into a sinkhole as to be bitten by a poisonous snake. Rationally, I realize that the earth is not going to swallow me up. This is simply a nightmarish vision, and like nightmares, it can’t really hurt me. But, no matter. I continually place myself in that tallest tree, waiting for the water’s to overtake me. Every Thursday night as I walk across Robert Morris University’s Chicago campus to my night class, I stop to get a cup of free coffee – or as I call it, liquid supplemental income – from one of the faculty lounge areas. A week later, they found me outside a 7-11 in the fetal position, jittering and surrounded by empty styrofoam cups, my nose caked in powder creamer. These days, I have coffee only a few times a week at most. On Thursdays, the coffee is more for routine than effect, because it no longer perks me up. It’s one of the few beverages that doesn’t have a measurable effect on me. For example, milk makes my bones strong, Gatorade rehydrates me, and tequila makes me think I’m attractive to women. I get my coffee from a delightful, space age coffee machine with a digital screen, fancy buttons, and coffee packets that look vaguely like birth control pill cases. I always select the “Donut Shop” coffee, and consequently feel saddened and misled when it doesn’t also produce a donut. After adding a packet of creamer, I come to the hard part: the sweetening options. I have convinced myself that I have a preferred artificial sweetener, though I can’t tell you which one, partly because I don’t identify the options by name, but by color. There’s the blue, the pink, and the yellow. They’re probably all the same, and they may not even be sweetener. There’s a good chance it’s just drywall dust from inside the Blue-Pink-Yellow factories. But I’ve convinced myself I need to select the correct color as if it won’t just determine the outcome of my coffee, but of my entire night. It’s like having Morpheus as a barista. I consider using regular sugar to avoid this problem. It would be the healthier option, after all. Recent studies have shown that regular consumption of sweeteners will gradually turn you into something artificial and overly sweet. We get it, Rachael. You’re chipper and happy. Now stop it. The problem with real sugar is that it is antisocial. The coffee and creamer mingle with ease, but the sugar granules just want to hangout together at the bottom of the cup. Stir all you want. 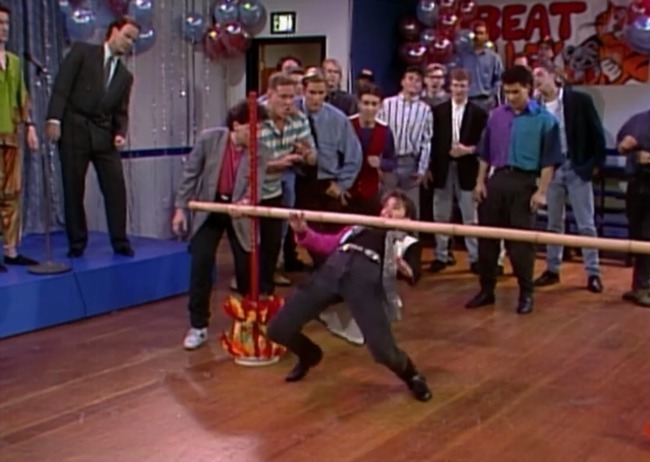 You have a better shot of mixing the boys and girls at a Bayside High dance after a Zack Morris prank. Limbo brought Bayside back together. You might even say Tori got “Sweet n’ Low” to win. 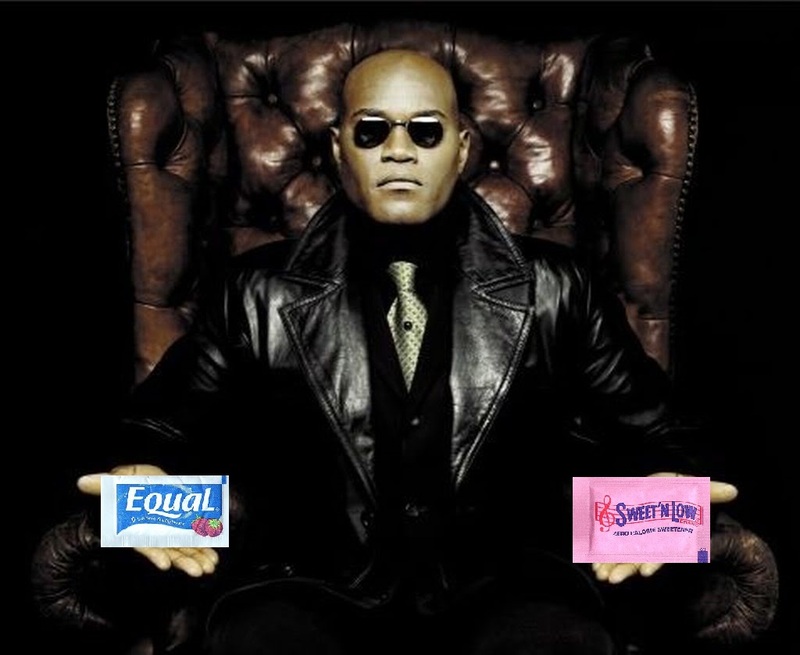 That’s why I like the artificial sweeteners – they’re the social butterflies of the beverage world. They come dressed in colors and fit right in. Fun fact: The person who discovered it was Alfred B. Stirrin of Bournemouth, England in 1610. Share that with your friends. During the short walk from the lounge to my classroom, I inevitably spill some coffee on my hand. I wipe it off with handouts or quizzes when I get to the lectern, making sure to pass those soiled versions out to create the illusion that I stayed up all night preparing for class. 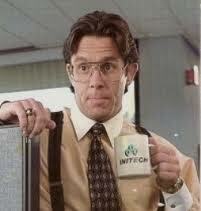 Is this a scene from Office Space or me lecturing on Thursdays? It’s hard to tell. For the first half of class, I lecture with Bill Lumbergh breath and even continue to take a few sips from the cup after it’s empty, just because I feel I teach better when I have a prop. And a week from now, this will all happen again, because routines are hard to shake, particularly when coffee is involved, and my Thursday nights are already set to brew. Please Mr. Spielberg, No More Historical Films. The other day I watched Saving Private Ryan for the first time in years. I think it is fair to say that Steven Spielberg is America’s most famous, if not most popular director. This is a bit surprising since Spielberg’s oeuvre the last couple decades provides evidence that he is obsessed with history, a subject American’s are notoriously NOT obsessed with. Since 1993, he has released films such as Schindler’s List, Amistad, Saving Private Ryan, Munich, War Horse, and Lincoln. Surprisingly, each has been commercially successful. Raiders of the Lost Ark: What Spielberg does well. Misplaced Humor: Spielberg can be a master of understated humor. In Jurassic Park, Jeff Goldblum’s sarcastic zingers are worth the price of admission alone. However, in historical films, Spielberg’s understated, sometimes goofy humor falls flat. You can see this most clearly in Spielberg’s most critically acclaimed, and serious film, Schindler’s List. On the whole, the director avoided such moments in his 1993 masterpiece, except for one instance of strange, awkward levity. Early in Schindler’s List, we see a large number of Jews being forced into the ghetto, while Polish children yell at, and women spit on, them as they pass. One rich Jewish family grabs our attention, since they are so obviously shocked by the hatred they face. In the next scene, the rich couple settle down in their enforced apartment, and the wife says the housing situation could be worse. The husband screams in reply, “How could it possibly be worse!? !” At precisely that moment, five or so Hasidim men and women walk into the apartment, each saying hello to the couple one at a time with bows and raised hats. Up until this moment, the audience had been focusing on this couple’s loss of privacy, freedom and dignity. After this goofy representation of cultures clashing (rich/poor; non-practicing/Orthodox; Western/Eastern), the audience is transported into a dour ‘Laurel and Hardy’ sketch. Monologue Speeches: Last November, I saw Spielberg’s Lincoln in the theater. The movie felt like three hours of monologues. Most characters in the film had at least one emotional, individual speech, while Abe Lincoln had too many to count. When Lincoln pontificated about slavery or the war, every character in the room went silent, and listened to the wise sage. No one argued. No one moved. The camera came in close, and the audience was made to listen and learn. Immediately after I walked out of the theater, I just assumed Spielberg had done what so many others had done before: Transformed Lincoln into a brilliant martyr who evidently understood the future of humanity. Part politician, part cherub. But, after watching Private Ryan, I realized Spielberg imparts monologues in most of his serious films. In Ryan, there were two to three scenes that were blatant examples that had me rolling my eyes. For instance, in the scene linked below, George C. Marshall reassures some of his doubting underlings that American troops must be sacrificed in order to rescue Private Ryan. Marshall waxes poetic by reading a letter by none other than Abe Lincoln to prove the necessity of a rescue operation. The music swells, the camera zooms, and we now have our moral lesson. How predictable. How ridiculous. So, Mr. Spielberg, I plead with you, focus exclusively on aliens, spaceships, dinosaurs and comic-book archaeologists. What’s that? You have plans for an Indiana Jones 5? Excellent. I’m on my quarter off from good ol’ RMU, which means I am free to do whatever I like, as long it is within budget, which unfortunately excludes my top choice—yachting in the Mediterranean. Nonetheless, I am doing my best to enjoy my time off, even though relaxing is not my natural state. Somehow I have stumbled onto the most cliché of writing assignments—“how I spent my summer vacation.” However, it is with true delight that I begin this self-assigned task. I read a lot. I have read all but one of the titles on my “Radical Summer Reading,” list. I am currently moving unhurriedly through As I Lay Dying, which is awfully brilliant, and, unsurprisingly, extremely depressing; such is the way with literary masterpieces, and I find reading tragedy is too overwhelming in the winter. When Faulkner gets to be too dark, I switch to something lighter, including The Lady Woolfs selection for August, Fraud by David Rakoff. My “want to read” list on Goodreads gets its due attention in the summer months when I don’t have to accommodate the grueling grading schedule that exists during the school year. Reading anything I want, for as long as I want, indoors at home, or at a favorite café, outdoors on my (new) deck, or at the park, ah, that’s luxury, yacht or not. One of the easiest ways to enjoy the summer is to behave like a 12-year old: spend time outside, play with friends, attend picnics and BBQ’s, ride a bike as often as possible, preferably to the pool. The Chicago Park District boasts an impressive number of indoor pools for use year-round, but swimming is much more fun in the summer. I love my pool, love it, love it. I am not telling you where it is; it is too crowded already. Open swim times are limited to a scant 9:00am to 10:00am Mondays, Wednesdays, and Fridays. 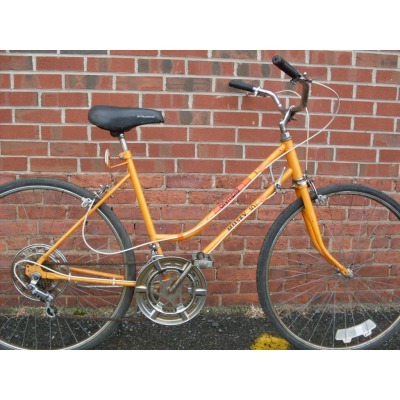 Thus, three days a week, I ride my orange Huffy cruiser, Orangina, to the pool. I always arrive early, kick off my shoes, stow my bike helmet and towel in a locker, affix my gigantic (over-glasses) swim goggles, and proceed to lane six. I choose the far side of the pool in an effort to avoid the many older ladies who ultimately spend most of the hour wading and chatting between sporadic bursts of water aerobics. These ladies begrudgingly allow me use of my swim lane, rushing back and forth as I swim directly at them. Nevertheless, it is encouraging to see older people in bathing suits. Once, a geriatric walker was parked next to my bike. Another spectacular summer truism relates to frozen treats: if they are available, by all means get some. My friend Tammy just introduced the Urban Family to Paciugo in Lincoln Square. I went crazy for the salted caramel gelato three weeks ago, and I am still thinking about it. I recently discovered that Miko’s, a Logan Square favorite, is a straight shot from my new apartment. There, a sign encouraged customers to try a combo, so I did: mango and kiwi. Kiwi was the winner. I haven’t walked up to The Ice Cream truck that rolls through my neighborhood, but summer isn’t over yet. And the tastes were certainly diverse. Five authors, five lists, and (unless I am mistaken) only ONE song was mentioned twice: Frank Sinatra’s version of “The Way You Look Tonight” made my Honorable Mentions list and was in Dr. Peter Stern’s Top 5. My Top 25 songs included, arguably, 12 or more genres of music. I wasn’t trying purposefully to be eclectic; those are just my tastes in music. Yet still, only one match. There is a reason why I find this lack of matches interesting. When people are getting to know someone new – colleagues, friends, dates, whatever – there are some typical topics that come up: favorite movies, TV shows, and music. In several of my classes, I even do an icebreaker that involves sharing our favorites in those categories. My reasoning is that this info is a nice, safe starting point: it is not too personal, it reveals a little bit about ourselves, and it potentially provides some points of commonality. As we share this info, it seems like it should have value. We value and love our music; it is a part of our daily lives. Music attaches to moments in our memories. It, sometimes literally, becomes the soundtrack to our lives. It must have value, right? Thus, when we hear someone else likes the same music, there is an initial inclination to think this hints at a deeper connection. Likewise, if meeting a date, people may later tell their friends, “He/she had GREAT taste in music!” (Which is really just a biased, narcissistic way of saying, “They like the SAME music as me!”) This connection wants to be a hint at compatibility. However, this information about musical tastes turns out to be largely irrelevant in establishing any kind of relationship with another person. 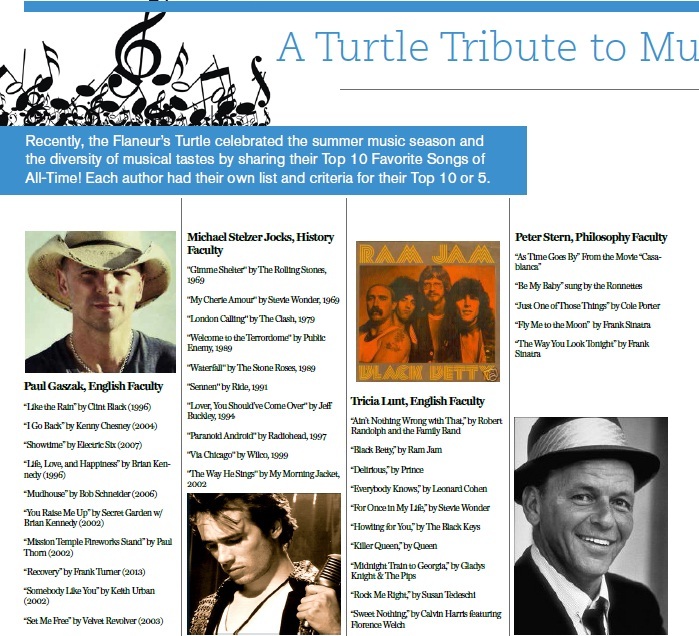 I consider all of the Turtle Hall of Famers who compiled song lists to be my friends. I love them all: I enjoy working with them, hanging out with them, talking to them. There were some songs on their lists that I also like, or even love. There were some songs and artists that I utterly detest. But, generally speaking, our musical interests are radically different. Beyond them, I don’t know anyone in my personal world who would have a list of songs that shaped up exactly like mine: not family, not people I’ve dated, none of my friends. Yes, there may be particular artists or songs that we have in common, but my unique set of favorites is just that: unique. And the lists from the other Turtle HOFers were also unique. If we used the lists as some kind of personality test before knowing each other, it might suggest we are all too different to get along. Yet, we do get along. As time has gone on, I’ve grafted musical tastes from other people onto my own. I think we all do this. Likewise, others have come to know and love new music through me. And that, I believe, is the true value of the lists we created last week. It wasn’t for readers to see which author they most identify with, or which author they believe has the “best taste” in music. The lists simply do not work as a compatibility or personality test. Rather, the lists were an opportunity for diversity and sharing; it was an opportunity to expose people to artists, songs, and genres they may not have otherwise taken a look at. Tags: Batman, Blake Whitmore, Doctor Who, Dr. Hannibal Lecter, Dracula, Fictional Characters, Han Solo, Harry Potter, Indiana Jones, James Bond, RMU Student, Romeo & Juliet, Shakespeare, Star Wars. Fictional characters are as real as we make them. They can live forever. They entertain, inspire, and sometimes terrify us. Their death can upset us; their accomplishments can please us. There are a whole lot of fictional characters, so what makes some so iconic? I have decided to take a look at my favorite fictional characters and figure out just what makes them so memorable. 1. The Doctor- Part of the most cross generational show on television, Doctor Who, the Doctor has entertained, educated, and inspired generations. The Doctor himself is a complicated character with an interesting story arc. He started out as a grumpy old man who traveled through space and time with his granddaughter, on the run from his own people, the Time Lords. Fast-forward through 50 years of character development and you see a badly damaged man trying to do his best to save and inspire humanity. Without Doctor Who science fiction writing and television would not be the same. 2. 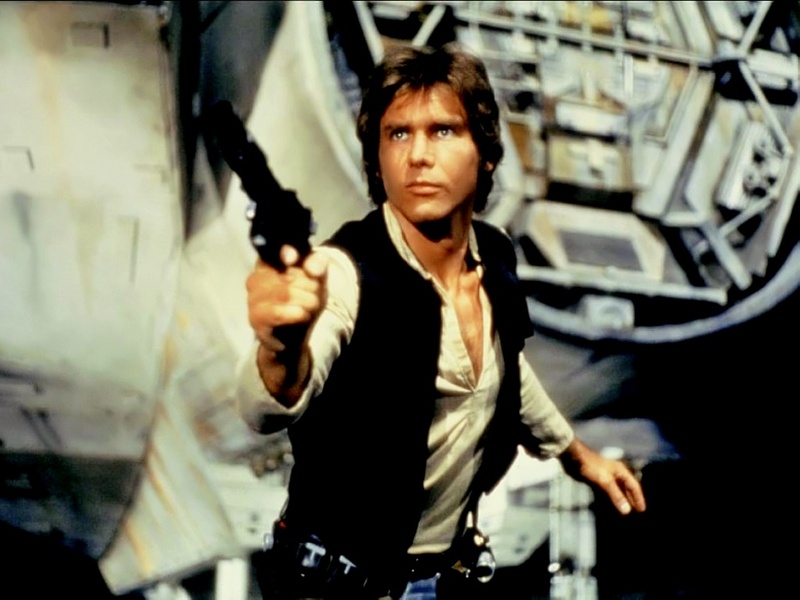 Han Solo-There is a lot of talk about Star Wars VII, and with that comes the triumphant return of the coolest gunslinger in outer space, Han Solo. He was the lone ranger of the future until running into Luke Skywalker and Princess Leia. Throughout the original trilogy Solo learns the importance of working with others to fight for the common good and restore peace and humanity to a struggling galaxy. Han Solo was a great practical smuggler with sarcastic wit. 3. Dr. Hannibal Lecter- The NBC series Hannibal was just signed for a second season and with it returns the terrifyingly brilliant Dr. Hannibal Lecter. He is a super intelligent psychiatrist and cannibalistic serial killer. For fans sometimes the lines are blurred between antihero and villain. Lector walks this fine line throughout all adaptations of him and that is what makes him so interesting. He is charming and smart, but then you remember he eats people. The creation of Lecter has been highly influential when it comes to writing a great villain. 4. Sherlock Holmes & Dr. John Watson- The first duo to make my list is the consulting detective and his loyal friend and author/blogger. Sherlock’s snarky, anti-social, attitude coupled with his powers of deduction and supreme intelligence made him a man that women, and even men, cannot resist. You hate him, but you still love. Without Dr. Watson recounting their tales of adventure what happened at 221B Baker St. would never have been quite as entertaining. Current adaptions of the pair are BBC’s Sherlock and Elementary on CBS. Funny fact: Sherlock never said, “Elementary, my dear Watson,” in any Arthur Conan Doyle story. 5. 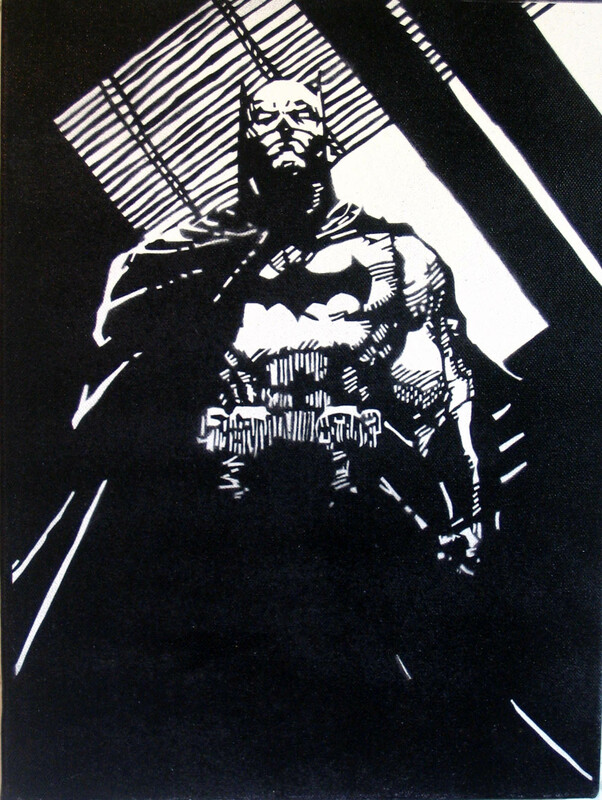 Batman- The superhero with no superpowers, but loads of money, Batman is one of DC Comics flagship characters. Nothing makes for a hero like serious childhood trauma, or the murder of Dr. Thomas and Martha Wayne. Batman being a vigilante made him all the more popular. The character became so popular he got his own comic book in 1940 and the rest is history. Television series, movies, and a whole lot of merchandise followed making Batman an extremely influential comic book hero. 6. Indiana Jones- Dr. Henry Walton Jones Jr. is an archaeology professor that wears a tweed suit, but much like a superhero, after the lecture is over he dons his fedora, grabs his bullwhip, and becomes Indiana Jones. It is the idea that after the grueling workday is done, he can have an adventure and save the world at the same time that makes Indiana Jones an appealing character. 7. Dracula – The second villain to make my list is the bloodsucker that spawned the modern day vampire. He is cunning and clever. Since the original novel Dracula has been the subject of a number of films. As of 2009, an estimated 217 films feature Dracula in a major role, a number second only to Sherlock Holmes (223 films). Films involving vampires have used the image of Dracula for their basis of vampires’ characteristics. It is evident that without the original Dracula our monster movies could be very different. 8. James Bond- He has had many faces over the years, but 007 always introduces himself last name first with a cunning tone. Originally created in 1953 by writer Ian Fleming, Bond is subject of the longest running film franchise in history starting in 1962, with Dr. No starring Sean Connery. James Bond is a handsome British Secret Service agent who often fights what seem like campy super villains. Bond is an inspiration to spy characters and we just can’t get enough of him. 9. Romeo & Juliet- This could not be a list of famous and influential fictional characters without at least one mention of Shakespeare. There is nothing more appealing than forbidden love. Many of Shakespeare’s works have been adapted and performed on stage and film, but, in addition to Hamlet, Romeo and Juliet is possibly the most recognizable storyline. Often with a little less death, the story has been told to all ages hundreds of times over since Shakespeare’s time. What would love stories be like without them? 10. Harry Potter- The newest character on the list, Harry Potter hit the shelves in Harry Potter and the Sorcerer’s Stone in 1997. Throughout the series, which goes on in six more novels, Harry works to overcome the leading antagonist and his parents’ murderer, Voldemort, who wishes to become immortal and conquer the wizarding world. Harry’s tough beginning to heroic victory makes him a much loved character. J.K. Rowling created what is possibly the most successful series since J.R.R. Tolkien’s Lord of the Rings. As a writer, I dream about creating a character as influential and memorable as the ones I listed. All of these characters have spawned film franchises, books, comic strips, cartoons, and television series. They will live on forever entertaining and inspiring future generations to come. They are the greatest people to never live. The first Friday in August is right up there with Thanksgiving or Christmas as my favorite day of the year. What is the first Friday in August , you may ask? At 6pm on that day, the Oak Park Public Library opens the doors of their Used Book Sale. “Screech”!!! goes the proverbial record. I think I can read your minds, dear readers. You are probably saying to yourself, ‘the opening of a book sale is one of your favorite days of the year? What are you, some kind of a nerd?’ Yes, that’s right. I am a huge, certified nerd; an outspoken, proud bibliophile. Now that we have my confession out of the way, let me explain why I love book sales, especially the one in my hometown of Oak Park. This will prepare you in case you wish to join me next year for the summer session biblio-extraganza. “It was the best of times, it was the worst of times“: Book sales are simultaneously wonderful, and horrendous. As you walk in, you get smacked by the stale, dusty air of thousands of old, used books. This bouquet is often intensified by the heat of the room. If the outside sear of the summer sun doesn’t warm up the air, then the crowding together of hundreds of bodies looking over the Cookbook section most definitely will. These book sale-ophiles are a strange breed. They can be rude, and pushy. Some act like it is ‘Black Friday’ at your local big-box retailer. Others are simply zoned-in on their books, and don’t realize others are trying to browse. You may ask someone to move without her hearing, and you need to squeeze by. What often happens is one or two or twenty people will just start reading a book in the middle of a row, causing the natural flow of shopping to halt. Therefore, if you are going to get all sweaty, carrying a huge load of books on your back, having your eyes water from ancient papyrus and mildew, you better find some good books on the cheap. 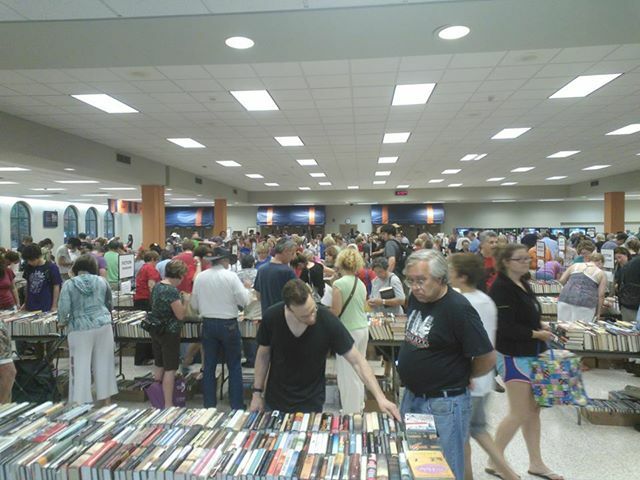 The OP book sale is as busy as any other (often more so), but it is huge. Over 100,000 books at extremely cheap prices. Two dollars for hardcovers, 1 dollar or 50 cents for paperbacks. This year, I was able to pick up about 30 books for 38 dollars. Jackpot! “Call me Ismael“: I often go into book sales with the hope of finding a ‘white whale’. That book I have been searching for that I just can’t get myself to buy new for 25 dollars. In other words, I want more out of a sale than just selection and quantity; book quality and rarity are a must. I believe it is one of life’s great pleasures to spy a never-opened, mint condition book for 1 dollar. 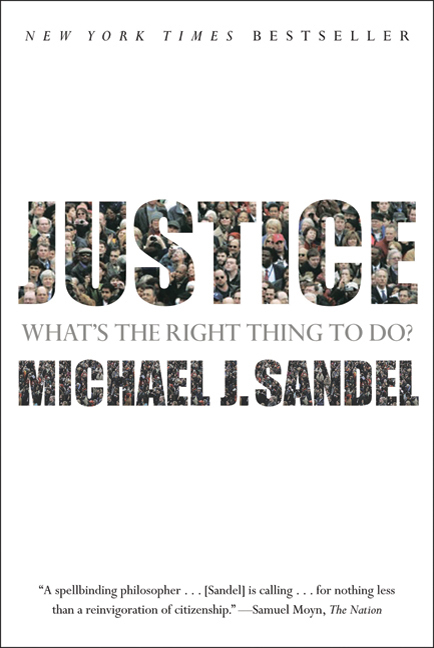 For instance, just this year at the OP sale I stumbled upon a paperback copy of Michael Sandel’s bestseller “Justice: What’s the Right Thing To Do?” As I grabbed it, I could instantly tell that the book was in great shape, and had likely never been read. On Amazon.com, the book costs 15 dollars. At the OP book sale, 1 dollar. Happiness is a warm philosophy book. “Happy bestsellers are all alike; every unhappy bestseller is unhappy in its own way…at a booksale“: One of the most humorous, yet annoying aspects of sales is the repetition of certain titles. 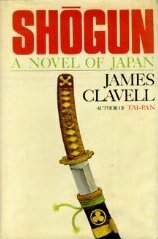 Some books have been ubiquitous sale standards for years, such as Alex Haley’s ‘Roots’, or James Clavell’s “Shogun’. Over the last two decades, I have seen a dozen of each of these 1970’s bestsellers at every sale I attend. New ubiquitous titles show up each year. A couple years ago, it was Helen Fielding’s “Bridget Jones’ Diary”. Then, it was James Frey’s “A Million Little Pieces”. This year, it was Elizabeth Mitchell’s “Eat, Pray, Love”. That book was EVERYWHERE. This is annoying because such books start to automatically catch your eyes, and hence, make you lose focus. If you see your 42nd copy of “Eat, Pray, Love” on a table, it is challenging to take note of surrounding books. I am sure I have missed many titles because I couldn’t see past a book sale bestseller. Damn you, Leon Uris! Let me end with my favorite, personal book sale anecdote. In July 2007, I packed up my then 7 month old daughter and headed to the Newberry Library book sale. Upon arrival, I put her in the ‘Baby Bjorn’, which kept her at chest height and allowed her to look outward at all the odd bibliophiles. Of course, I knew I had perhaps 45 minutes to get through the whole sale, since my little one would start to get bored relatively quickly. So I was moving fast, bending over consistently to see the many books laid out on the tables. Sometimes I would need to do this peeking over others, as I couldn’t wait around for each browser traffic-jam to clear. One time, as I tried to peek over some fellow shoppers, my little angel produced a massive belch. The dozens of people within 10 feet of me gave me a partly disgusted, partly quizzical glance. They undoubtedly believed only a grown man could burp like that. I wasn’t embarrassed; I had tears of laughter rolling down my face. I figured all is fair in love and book sales.